The Recent Products widget allows you to display all your recent WooCommerce’s store products in your site, with the option of choosing their exact parameters: All Products, Featured Products, On-Sale Products and Top-Rated Products. This widget is extremely useful for your Home Page, especially if you’d like to bring certain products to your users’ attention. Title: You can place here the title to be shown above the list of products. Number Products: Set the number of posts that will be displayed in the widget. Order By: Set the order in which you’d like the gallery to be displayed. By date or randomly. Order: Choose whether the order of the galleries will ascend or descend. 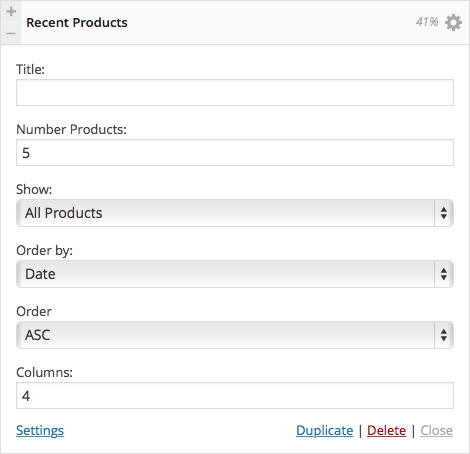 Columns: Set the number of columns in which you would like to display the product.